AminoGenesis LashGenesis - .20 oz./6 mL. WHAT DOES IT DO? Enhancement formula for natural longer, stronger, fuller lashes. 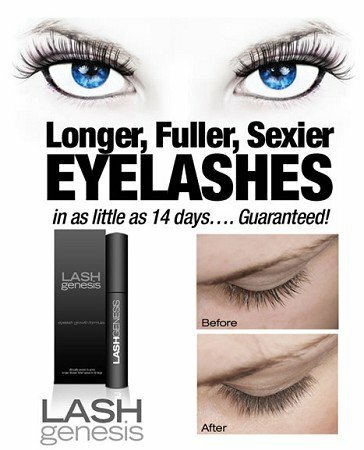 How does LashGenesis work? Your eyelashes are "manufactured" in the tiny hair follicles on your eyelids. Eyelashes are made mostly of various protein (like keratin) and water. These proteins are made of tiny building blocks known as amino acids. LashGenesis uses the exact and optimal combination of these natural building blocks to enhance longer and stronger eyelashes. Just like adding nutrients or fertilizer to your plants at home, LashGenesis uses natural eyelash "fertilizers" to achieve dramatic results. How soon will I see results? One of the most amazing aspects about LashGenesis is how quickly it works. In clinical studies performed in a physicians office, photographic evidence showed remarkable increase in eyelash length, thickness and density in as little as 14 days. However, the most dramatic results occur when LashGenesis is used twice daily on an ongoing regular basis. Can I use LashGenesis with other eyelash growth products? While it is ok to apply make-up or eyeliner after LashGenesis has completely absorbed, we do not recommend you use other eyelash growth products in conjunction with LashGenesis. Other products may interfere with the effectiveness of LashGenesis or cause undesirable results or irritation. HOW TO USE: Apply twice daily to the base of the eyelashes with applicator brush provided. Avoid direct contact with eyes. Rinse brush with hot water and dry before replacing into product tube. Lash Genesis is an eyelash enhancing product; Not intended to prevent, cure, or reduce hair loss or to promote the growth of hair. INGREDIENTS: Water, Glycerin, Pisum Sativum (Pea) Extract (&) Glucosamine HCL, Hydrolyzed Lupine Protein, Palmitoyl Dipeptide-5 Diaminobutyloyl Hydroxythreonine & Palmitoyl Dipeptide-6 Diaminohydroxybutyrate, Phenoxyethanol (&) Ethylhexylglycerin, Butylene Glycol (&) Carbomer (&) Polysorbate-20 (&) Palmitoyl Oligopeptide (&) Palmitoyl Tetrapeptide-3, Hydroxyethyl Cellulose, Xylitylglucoside Anhyroxylitol Xylitol, Alanine, Proline, Glycine, Magnesium Ascorbyl Phosphate, Tetrahexyldecyl Ascorbate, Tocopherol, Panthenol, Helianthus Annuus (Sunflower) Seed Oil (&) Lupinus Albus Seed Extract, Acetyl Hexapeptide-3, Soy Amino Acid, Disodium EDTA, Triethnolamine.